Rise & Shine Restaurant Group has a lot on its plate in 2018, no pun intended. In addition to more locations of its epidemic Breakfast Republic concept, North Park Breakfast Co., Eggies, and Liberty Station's incoming El Jardin, the hospitality collective is also opening dual concepts Casa Rustica & California Taco Club within the former Crudo by Pascal Lorange space in The Village at Pacific Highlands Ranch in Del Mar. Johan Engman's Rise & Shine Restaurant Group began in 2008 with the opening of the flagship Fig Tree Cafe in Pacific Beach. The burgeoning San Diego hospitality collective now operates three Fig Tree locations (PB, Hillcrest & Liberty Station) and packs the house at 7 locations of his Breakfast Republic eateries (North Park, Ocean Beach, East Village, Encinitas, Liberty Station, Carmel Valley, and Pacific Beach). Anticipated to debut in May 2018 will be the 8th Breakfast Republic, opening inside The Shoppes at Carlsbad - the brand’s first venture inside of a retail mall - followed by two more outposts in the works for within the space that currently houses Panda Express across the street from Westfield’s Mission Valley Plaza and the first location outside of San Diego that will debut at 4213 Campus Drive in Irvine, CA. Engman also has North Park Breakfast Company near completion for early 2018, is opening a from-scratch Italian concept previously dubbed Pizza Republic in North Park (now called NorPa Kitchen), and is building an upscale Mexican restaurant in Liberty Station named El Jardin, whose Executive Chef Claudette Zepeda-Wilkins is currently competing on the most recent season of Bravo network's Top Chef culinary competition. 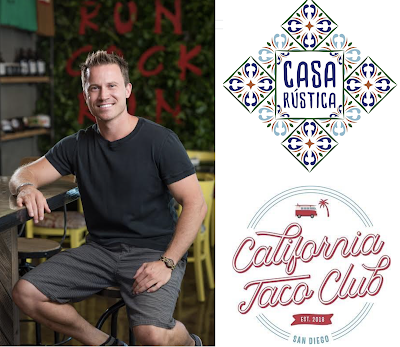 Casa Rustica & California Taco Club will be sister concepts located in the space left dormant by the short-lived Crudo French restaurant in The Village at Pacific Highlands Ranch in the Del Mar area of San Diego's North County. Casa Rustica will be a more upscale eatery, offering a scratch-made menu of modern Mexican dishes. California Taco Club is expected to be a contemporary taqueria with an eclectic array of tacos served on house pressed tortillas, as well as burritos and side dishes. It is expected that Rise & Shine's Corporate Chef Claudette Zepeda-Wilkins is developing both menus. The restaurants are anticipated to open by late Spring/early Summer 2018. Rise & Shine is also in the process of introducing a new morning concept named Eggies, which will be a fast-casual line of walk-up eateries operating out of 20' x 8' converted shipping containers installed near three of San Diego’s busiest Breakfast Republic locations - Pacific Beach, East Village and North Park. Eggies will be a "food stand" that will serve up various versions of breakfast sandwiches, plus a number of unique egg-centric entrees served in Mason jars (think Eggslut), along with organic nitro cold brew served over coffee ice cubes, organic drip coffee, fresh squeezed OJ, and salted Cajeta-Stuffed Churros.